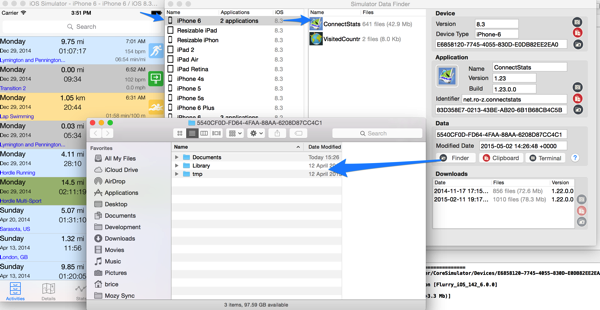 Simulator Data Finder greatly improves my workflow in working and debugging apps in Xcode 6. You can download it here. My apps relies on many downloaded json and xml files, as well as keeping all its data as sqlite files. I use Simulator Data Finder to easily access these files, copy them from one simulator to another or bring into the simulator the files from a device. The first use is to access the files, either by the finder or terminal. The terminal is actually quite handy to work with sqlite files and sqlite3 directly, use grep or any kind of other shell tools for old school developers… Simulator Data finder has a clipboard button so when terminal’s tool are not enough, it’s easy to paste the directory and access it from emacs for example. Another typical use is when you have a lot of files and you want to keep the same setup into a new iOS Simulator version. For example you have everything setup on the iPhone 6 simulator, but want to see how it looks on iPhone 5. Simulator Data Finder makes that a breeze. You can easily choose the two simulators from the table, open the two Documents folder with the finder and copy the files over. This makes it very easy when a new version of iOS or Xcode comes out to move all the files you need. The older version will be easily accessible and clearly labeled. If you work across two device simulators, the modified date also lets you see at a glance which of the two simulator has the latest modified files. The other task that Simulator Data Finder makes easy is to move around of files between the device container and the simulators. When a developer device is connected, download the application container to your download folder using the standard name. 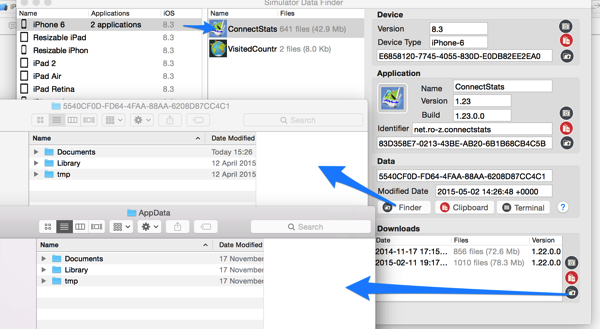 Simulator Data Finder will then present all the container it finds in the Download folder that match the app you have currently selected. If you pop up the finder for the container and for the simulator it becomes very easy to copy files. The containers will also be conveniently sorted with the most recent on the top of the table. This entry was posted in iOS development, Simulator Data Finder and tagged Simulator Data Finder by Brice. Bookmark the permalink.